​​​ EL PASO – The area's second micro-hospital is being built on the 11300 block of McCombs St. and the Patriot Fwy. in Northeast El Paso by the Hospitals of Providence. Officials with the hospital chain broke ground on the $18 million, 40,000-sf hospital and medical offices; it is expected to open in fall 2018. 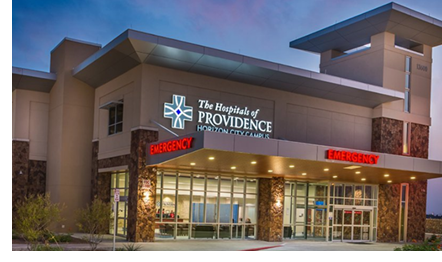 It will be similar to Providence's first micro​-hospital, which opened in September in Horizon City. The Northeast hospital will have an emergency room with eight exam rooms and eight inpatient rooms for patients who require overnight observations or very short hospital stays. It also will have a lab, pharmacy and imaging equipment.